Another Awesome Dragon Tale Adventure! Excellent adventure in conquering fears! I bought this book for my son as a gift for the day of surgery - honestly I think I was more scared than him! 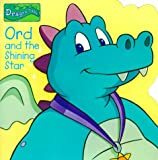 We frequently read this lovely story of Ord's adventure in the Forest of Darkness and how the love and trust of his friends helped him achieve a new ability. My four year old loves the Dragon Tales show and so of course likes this book as well. I disagree with the rating of this book as for babies as well as preschoolers. My 2 year old would never sit through 3 or 4 paragraphs per page. Certainly it is appropriate for preschoolers.